Abu Dhabi & Dubai Translation Initiatives to Preserve the Past! One needn’t be an anthropologist or dealer of antiquities to understand the importance of preserving cultural treasures in danger of being lost or destroyed, yet that’s exactly the state of affairs in which the United Arab Emirates finds itself at the moment. Any number of outside forces from war, paper deterioration and loss, have accelerated the pace at which treasured writings are disappearing. To counter this trend, the UAE has established a dramatic initiative to protect, preserve and ultimately translate millions of books, documents, poetry, literature and treatises so not only are these ancient and not-so-ancient treasures saved from extinction, but thanks to a revolutionary translation effort, these writings will be made available to Arabic and non-Arabic readers around the world in myriad languages. According to noted journalist Rym Gazalm, writing for “The National,” even the smallest effort to preserve and translate treasured writings is critical, which is how she stumbled upon the Dubai bookshop Dar Al Fadeela one day and discovered a singular grassroots effort to safeguard literature that harkens back to early 19th and 20th centuries. Her chat with Mohammed Al Sayed proved an eye-opening look at the looming threat hovering over a declining number of writings that regularly disappear off the face of the earth. Over time and without intervention, shopkeeper Al Sayed notes, the works of great Arab authors have begun to disappear, go out of print and are systematically lost or destroyed. These factors that have the potential to leave in their wake culturally bankrupt societies. These days, Al Sayed’s one-shopkeeper crusade is just the tip of the iceberg. In fact, the entirety of the United Arab Emirates has jumped on the bandwagon, reports Noorhan Barakat, a “Gulf News” reporter whose October 20, 2016 article on the first Dubai Translation Conference shows the movement’s seriousness of intent. Why bother to hang on to these writings, translate them and make them available to readers of many languages? Because, Gazalm reminds the public, what better way to take the pulse of a society’s ideas, thoughts, discoveries and past—indeed “the pulse of a generation”—than by perpetuating writings by all means possible? The mere act of translating tomes so readers from all corners of the world can read them in their own language may be a Herculean mission, but those who have taken up this imperative are undaunted. This means that translators find themselves highly sought-after, a point driven home eloquently by Shaikh Nahyan, whose address at the Dubai Translation Conference made clear the vital role translators play in this massive effort. “The UAE is a global crossroads,” he reminded attendees. In his opinion, this initiative has far-reaching consequences that transcend a commitment to restore, protect and translate written words. In fact, it has the potential to turn the UAE into an international hub known as much for this literary Renaissance as it is for energy production. Referring to ancient Greece’s efforts to chronicle and translate all of that nation’s ancient works, Shaikh Nahyan, and others involved in this massive project, intend to leave no subject or language untouched. Given that mandate, Abu Dhabi and Dubai stand to become epicenters of a modern movement that replicates Greece’s “House of Wisdom” movement in which every scientific, literary and artistic topic available was translated into languages spoken and read by all known inhabitants of that continent. While Arabic is the 5th most often-spoken language on the planet, it’s translation record is not impressive. Notes Abdullah Al Shaibani, secretary-general of the Dubai Executive Council, when it comes to translating Arabic writings to other languages these days, those charged with this responsibility come in at a poor 17th position in the world and the language fares even worse on the UNESCO Index of Translation statistics, where Arabic ranks 29th of 50 root languages translated for consumption by non-Arabic readers. 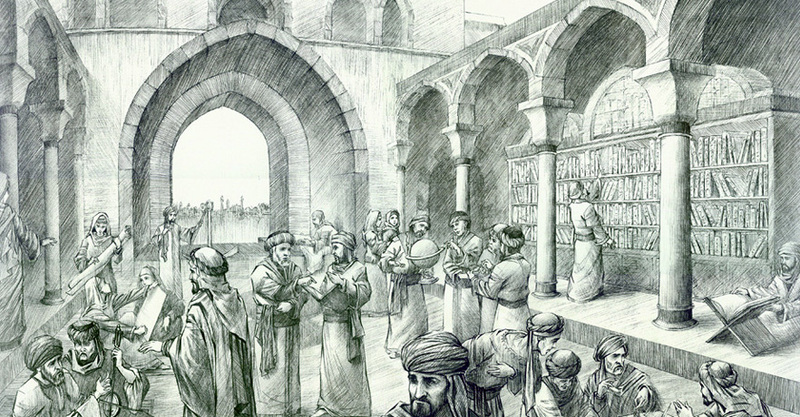 How important is this effort to restore the position of Arabic literature through translation and dissemination? It has the potential to reinstate irreplaceable literary artifacts in a world that’s short on superheroes eager to keep cultural treasures relevant and plentiful. In fact, the UAE has set itself a loftier goal, under which this umbrella of restorative literature is only one facet of its global initiative to look after a large segment of the world’s cultural heritage. Given world tensions and conflict, the loss of cultural artifacts is profoundly regrettable, but in a region of the world known as the cradle of civilization, this endeavour has been declared a priority, and there’s no reason why Abu Dhabi shouldn’t become an epicenter for the preservation of human cultural heritage. But exactly what will this entail? Tracking down and obtaining not only originals but reprints of all manner of writings in the Arabic language. Searching for the names of authors associated with deteriorating examples of printed matter. Securing proper permissions for restoring, translating and reprinting writings. Salvaging text deemed “unreadable” by experts analyzing the most deteriorated tomes. Producing “readable” versions of literature typeset in illegible or hard-to-read fonts. Contributing to the national dialog to preserve and protect Arab dialects and mother tongues. Providing alternatives to English-language books currently favoured by the social media crowd who have no clue that classic literature has shaped and inspired middle east cultures for thousands of years. Is there a timeline? Not exactly. The task is too monumental and threats too pervasive. Yemen, Iraq, Libya, Syria, Tunisia and other Arab-speaking nations have failed to make efforts to preserve their literary past because war has left people too preoccupied with survival than to give a care about preserving the past. Sadly, there is no sign this conflict is going to cease any time soon. Further, frequent acts of sabotage and destruction unleashed at historic and archaeological sites, plus smugglers and looters seeking personal gain by snapping up valuable antiquitie, puts pressure on those involved with the Abu Dhabi and Dubai cultural heritage initiative. With each passing day, a bit of the past is lost. By creating a safe haven in Abu Dhabi for the collection, analysis, translation and preservation of every morsel of writing that can be found, the United Arab Emirates will undertake an effort that few others have had the fortitude to tackle: a global humanitarian movement to literally save culture from vanishing forever. Given other pressing global matters, does it matter that massive amounts of time, effort and money are being allocated on such a large scale to restore precious pieces of the past? Of course it does. Setting this example not only honours the past, but has the potential to inspire other cultures to emulate this remarkable undertaking. Further, adult-appropriate ancient texts, writings and manuscripts aren’t the only items being sought for restoration and translation by those invested in this noteworthy project: children are also recipients of this literary largess. By the end of 2016, the UAE’s Kalima project announced the translation of its 900th book. This announcement was made with much fanfare at a grand celebration showcasing the nation’s Year of Reading. “This project is still hungry for more achievements,” proclaimed Abdullah Al Ali, acting executive director of the nation’s libraries. His words are prophetic. That’s a sentiment that could easily be repeated by everyone involved in the current race to save Arabic writing from extinction—-a goal that deserves to be celebrated in a world that is short on respect for cultural treasures, but prioritized by a nation that understands the enormity of every loss.